Welcome to Natasha In Oz! Thanks so much for dropping by. Back in my University days I did a subject that was totally dedicated to Hollywood musicals and I had to write a very long and extensive paper on the film State Fair. I watched this movie over and over again (both versions) and loved everything about it. The Rodgers and Hammerstein score was beautiful and I just loved looking at the costumes and sets. It was probably this movie that started my obsession with all things old-fashioned and vintage. The other reason I loved this movie was because the shots of the fairground reminded me of the Queensland version of a State Fair, The Royal Queensland Show. Back in August 1875 a group of colonists met at the Brisbane Town Hall to form the National Agricultural and Industrial Association of Queensland. The Association's Charter was to promote and encourage the agricultural and industrial development of Queensland as well as provide the opportunity for country and urban residents to come together in a celebration of Queensland lifestyle. The 'Intercolonial Exhibition of 1876', held from 22 - 26 August, proved a triumph beyond all expectation. A public holiday was declared, and on opening day, 17,000 people attended - a great feat at a time when the total population of Brisbane was only 22,000. Men attended in their suits and ladies in their finest garments. Food was served on long tables and the first show bag - a bag of coal - was free for all visitors. Today, our family went to the Ekka and we had a fabulous time. There was an atmosphere of happiness and joy that was truly infectious- everyone was smiling! 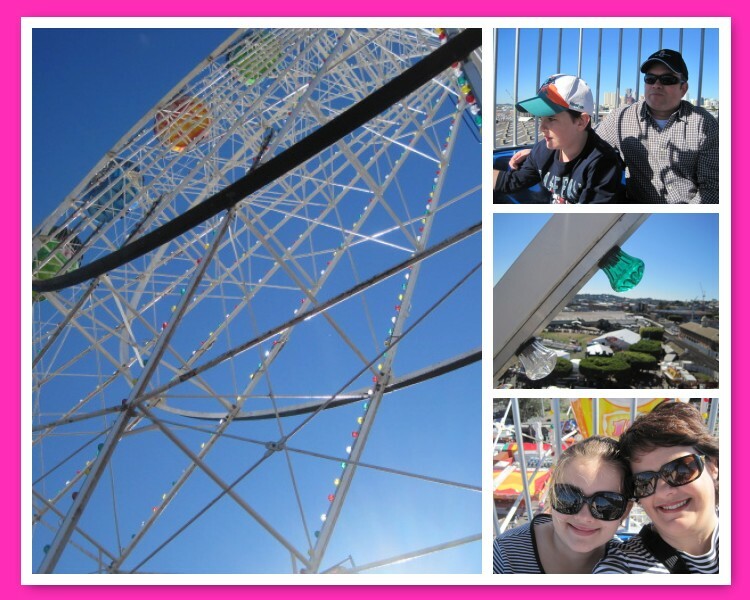 We started the day with a ride on the Ferris Wheel. After that Mr Attorney took the kids to "Sideshow Alley" where they they tried their luck on a few games. After all that hard work it was time to eat...What should we have? Ribs, hot buttered corn and maybe a turkey leg from this bright Yellow vendor!? What about some PINK fairy floss? 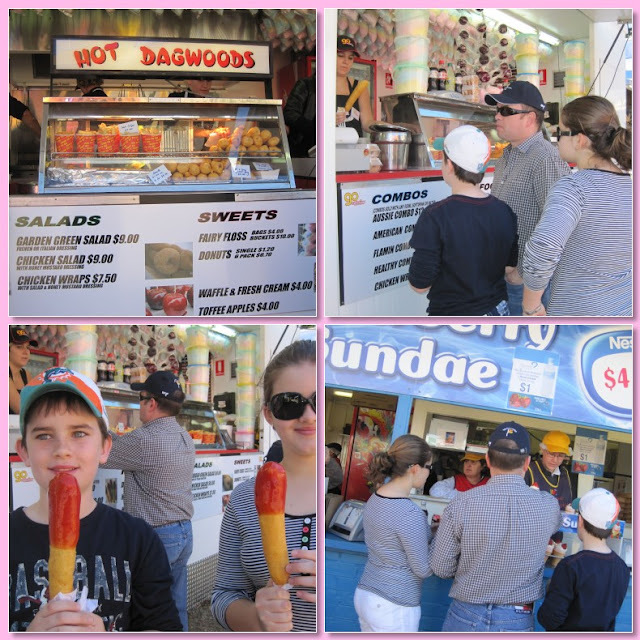 I think Dagwood dogs and ice cream sound just perfect! While we ate our food we watched some events in the arena and we spotted some fun people too! We then went and saw some of the exhibitors displays. 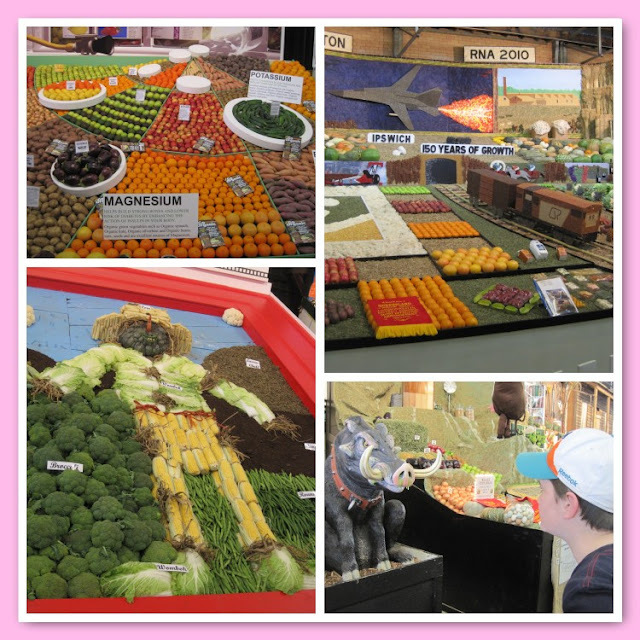 Our favourite was at the produce area where people made amazing displays made of fruit and vegetables! Look at all of those gorgeous Yellow Lemons! We finished the day at the Show bag stand and thank goodness, there was not a bag of coal in sight.....Only lots of toys and candies! There was even a Baseball display and Big Al won baseball cards and an Arizona Diamond Backs pencil! To top off an already fabulous day, the weather was spectacular! And this brings me back to the movie State Fair and to my Tuesday Tune! It might as well have been Spring! What a fabulous day OUR family had at OUR state fair! If you would like to share a Tuesday Tune this week please join in! Just click the Tuesday Tune button below. Thanks so much for visiting me today and thanks also to the very sweet Beverly for having me at her weekly Pink Saturday Party and to Jenny who is hosting a special Rainbow version of Alphabe Thursday! And of course, thank you to my sweet blogging friends for visiting me today! Your kind words and visits each week make me so happy! I always have so much fun reading your posts and learning a little history!! Looks like a great day! I was getting hungry as I was reading your post and then saw the picture of the ice cream with strawberries! Yum!! Love the photos looks like a beautiful clear, dry day!! What a great day you all had, I remember those scary looking clowns, with wide open mouths, from visits to the Pleasure Beach at Blackpool when I was a child. A fun day out and you took so many photos Natasha! I have my Sunday Song already to publish this week so will be back as soon as it is Sunday morning and I am online again to link up and visit other links. Meanwhile hope you have had a good weekend, certainly looks like it from this post. Looks like fun. It's been years since I've been to a fair and my kids never had :(. We may have to find one near us. Happy Pink Saturday. Hope the pink cotton candy was as good as I remember. Great pics, I felt like I was there! Your kids are so cute, too. Oh How Fun ! I love the sun glasses! wow what a cool fair I want to join us guys! One of my fondest memories is my father taking me to the Southeastern Fair every fall. I do think he really enjoyed it, and I gave him an excuse to go. However, when I reflect on those many years of fair rides, turning this way, that way and finally upside down, and that he never said,"Not me, you go on it by yourself," not even once, I realize how lucky I was to have him. These are great memories that your kids will reflect on one day. Looks like a very fun day! I wish my Winter was like that. Lovely!! Looks so much fun, and WOW that vegie scarecrow! Too cool. Loving seeing your gorgeous kids, love them. Love that photos of you and maddy. Lovely. Looks like you have lots of fun! lovely shots. 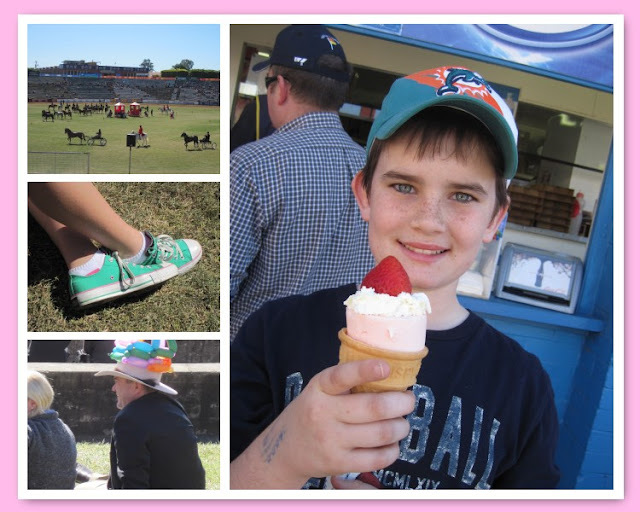 Natasha, you took some lovely photos from your day at the show, it looks like you had a great day with your family. Looks like a wonderfully fun day and the food looks great! Wishing you a happy PS on my first time! Happy Pink Saturday and Happy Sunday Song, Natasha. I love this post - it makes me smile. The fair looks fantastic, and your photos are awesome. The ferris wheel was always my favorite ride. And wow, look at the size of those Dagwood Dogs! Your family is lovely. I'm so glad you shared this special day with us. This is a favorite movie of mine, too. I adore the old musicals. Beautiful pictures!! Looks like a fabulous day at the fair! awww, Natasha, I clearly shows SPRING is arriving at your doorstep. Do enJOY JOY JOY! first of all, your children are beautiful! Oh how this makes me think of the royal easter show! man i miss that! Loved the pics darling, hope ur well! 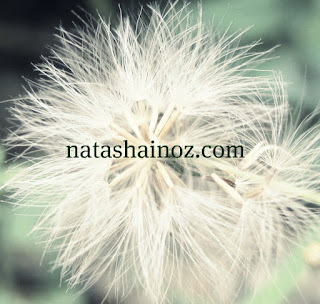 I am so glad you stopped by my blog. This post reminded me of great fun time we had with our daughters when they were young. Plus Fair food is hard to beat! What cool pics!!!! I love the State Fair and will going in a couple of weeks. My Mom loved that movie so much! She was a little girl when it came out and she always talked about how much she loved it. We grew up at the fair, showing livestock and 4-H projects. I like seeing the ferris wheel from all those different angles. my husband recently smoked turkey legs, and i refused to try them. i just can't. those hot dogs looked enormous! Our state fair begins next week! Isn't funny how no matter where you live in the world, there are so many common ties? Many of the images you feature here look so similar to our state fair, except for the horrible heat & humidity that we must endure during that time. Hope you had fun! Oh my darling...What a wonder filled day you all had!...We have a little country fair in our area too...Ahhhh...such great memories. I know , right? I'm dieing! Btw- I love your photos! What wonderful time! I love the fruit displays. Someone has very creative eye for fruits and vegetables. I love the fair! Not the rides so much anymore, but the crafts and gardener displays are my favorites. Love the fruit display here! Love the yellow in your post!You all had a great time at the Fair. PS Mine this week is OVER HERE! Hope you can stop by. Great photos and very nostalgic, too. I love state fairs! nice weather u have there..
Looks like a great family day and I saw lots of yellow in those photos. Awesome post! I enjoyed the video. Now that looks like a Fair with something for everyone - the food, the exhibits. I'd love to have been there too! What a fun day! I LOVE that VW van, it's gorgeous! And the rides look like alot of fun, although those clowns in sideshow alley give me the creeps :) Is fairy floss what we call cotton candy? If so, I'll take some! Fun, interesting yellow post Natasha. This looks like such a wonderful, fun family day. I love all the yellow in there. omg, your photos are just gorgeous! it looks like fun was had by all! What a lovely post. Your family is gorgeous. These pictures are fantastic! I love the "fairy floss" and your descriptions. I felt like I was there with you. 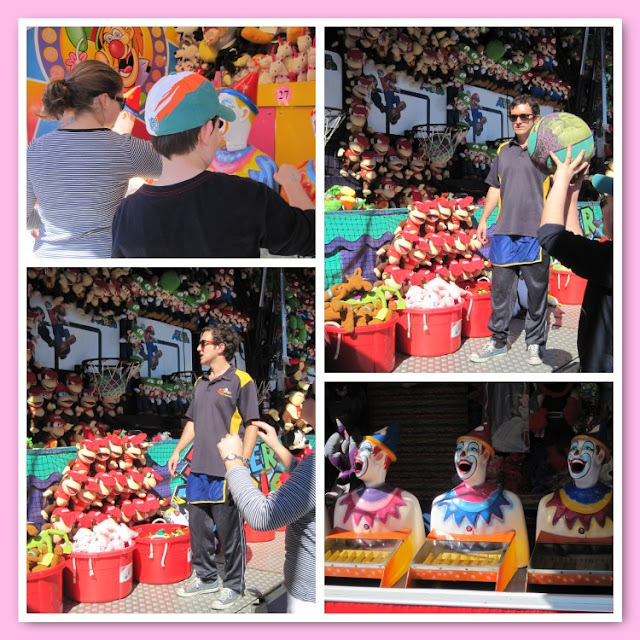 The hot, delicious food, the shouts of children on the rides, the scent of happiness in the air. And all without sore feet! Thanks for this wonderful link for Alphabe-Thursday's Rainbow Summer School.